The summer of 2018 will be remembered by many gardeners as the year of the tomato. Despite a dry spell the last three weeks of August, it’s been a banner season for those ruby-red orbs of sweetness. My garden was no exception. I’ve been inundated with tomatoes since mid-July. It’s partly my own fault. After a 2017 in which my tomato crop was beset with blight, I decided to plant a few extra tomato plants this year. My gardening season began in March, when I started about 40 tomato plants from seed along with a few kale and bell pepper plants. I was very successful, with much help from Therese, who has a thumb that may be greener than mine. Once the weather started to warm in April, we started moving the plants outside to our mini-greenhouse during the day. By the time they were put into the ground in mid-May, the plants were well on their way. And guess what? We had hardly any blight this year, so our crop was much larger than we anticipated. What that has translated into has been more than 50 pints of whole tomatoes and nearly 70 quarts of tomato juice on our pantry shelves. And that doesn’t include the many BLT’s we been enjoying at least once a week. I would be remiss, though, if not mentioning the fresh salsa that we’ve also been relishing. I used to can salsa but now make it fresh, even in the winter, when canned tomatoes are used. The recipe I like came from Mary Urbanski, former assistant director of residential dining services at the University of North Dakota. The recipe is for a garden-fresh salsa (salsa fresca or pico de gallo), which Mary said was a favorite of UND students. The recipe was the creation of Greg Gefroh, executive chef of dining services at UND. The recipe features fresh tomatoes, jalapeno peppers, red and green onion, garlic, cilantro, lemon and tomato juice and seasoning salt. Greg told me the salsa can be canned, but around his house, it never lasts that long. I can attest to that. Place all prepared vegetables in large bowl. Stir to incorporate. Add garlic, seasoning salt, tomato juice and lemon juice to mixture. Note: Wear gloves when handling jalapenos, and do not touch face with hands. 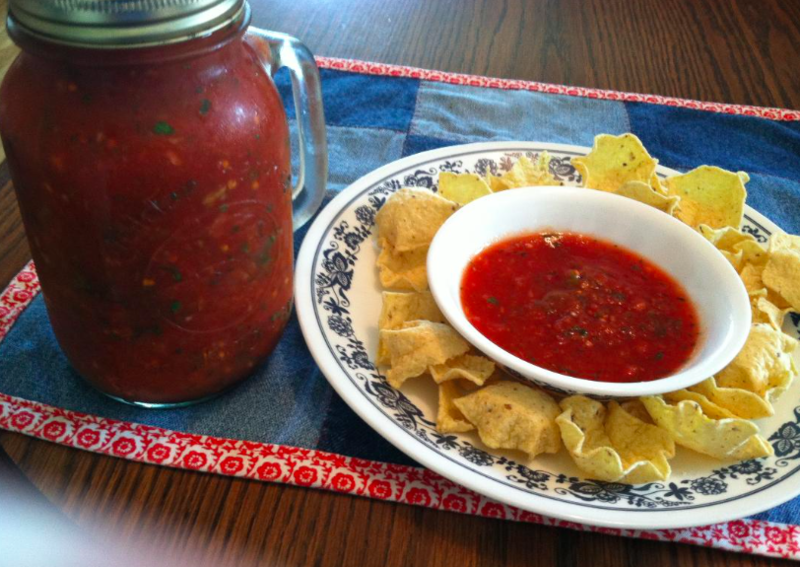 Salsa is best when refrigerated 24 hours to blend flavors.